Making an entrance. | House by the water. I’ll take one of those, please. Designed by Tim Steward Architects. Source: HomeDSGN. We’ve been playing around with ideas for the front entrance and yard. We needed to make a decision about the floor surface for the patio. To cut a long story short, we’ve decided on timber decking. It will match the interior flooring when the front door is open, and will tie in with the deck at the rear of the house. I showed this stunning picture to my live-in handy man as a model for the patio decking. Always ambitious, he’s already planning not only the jetty-style path, but the water on either side too. We’ll see…. You might think it is a little early to worry about the front yard, but with site works commencing in the near future, we wanted to think about how we would deal with the small slope (about 70 cm over 10 metres) from the house to the verge. So out came the colouring pencils and graph paper. 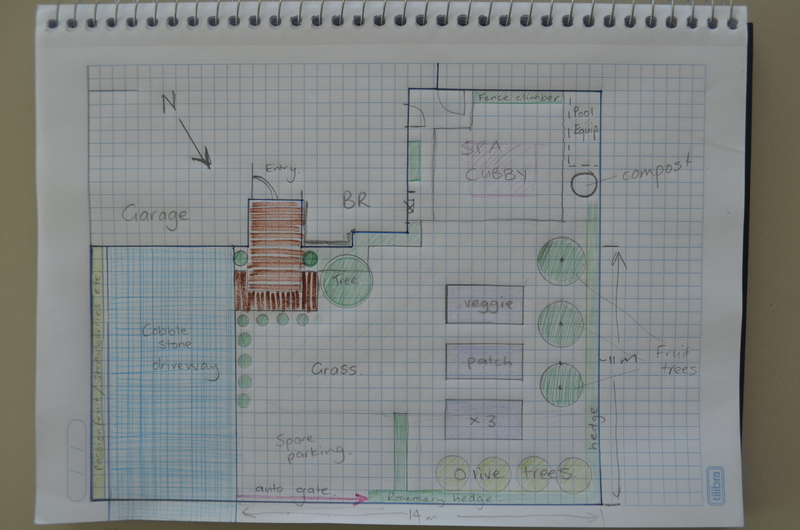 The front yard plan, with plenty of scope for change later. I struggled to think how this was going to work in 3D but this is what I’ve surmised: The driveway will slope from the garage down to the verge. We will flatten the front yard by dropping the ground level in front of the house and increasing it towards the fence line. This way we can avoid complicated plans and approvals required for retaining walls over 50cm high and can add interest to landscape in front of the house by including a step down from the patio to the path, maybe even some water. 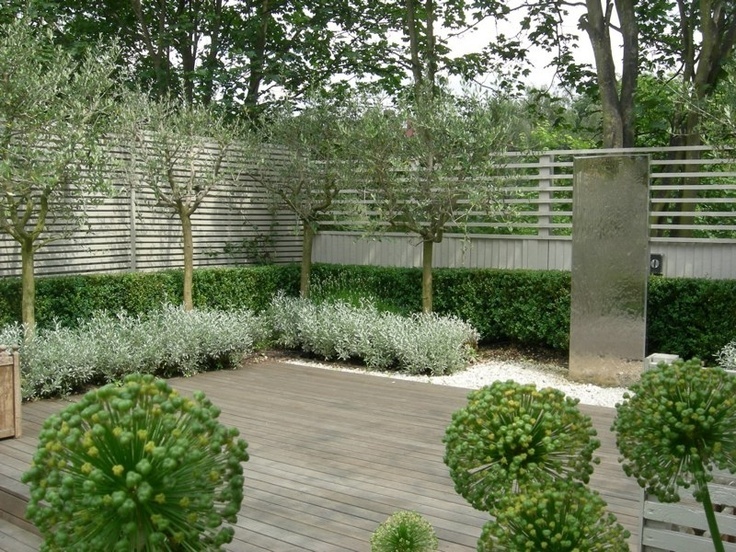 Looking out from the front of the house, it should look a bit like the next photo, except where the decking is – think of a vegetable garden in raised beds. Finally, I returned to one of my recurring dilemmas, the front fence. I eliminated some of my favourite ideas by putting them on the mood board, only to discover they didn’t compliment the house facade at all. Now, I’m planning a more subtle fence – hidden behind the trees. 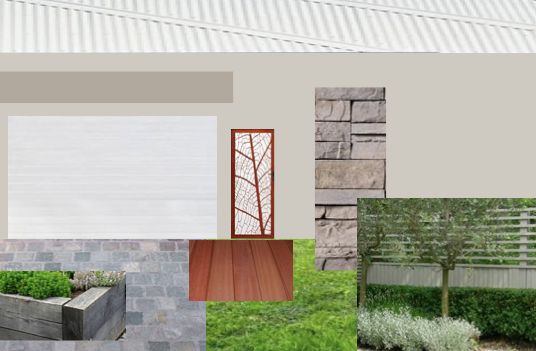 At last, I have a mood board for the front facade and front yard that I’m very pleased with. You can find the colour and material details of this mood board on the Colour Selections page. If you want more inspiration for your own front yard, check out my ever-expanding Pinterest files: Outdoor, Front fence, Front yard, Plants, Veggie patch and Driveway. I can’t wait to get my garden gloves on. 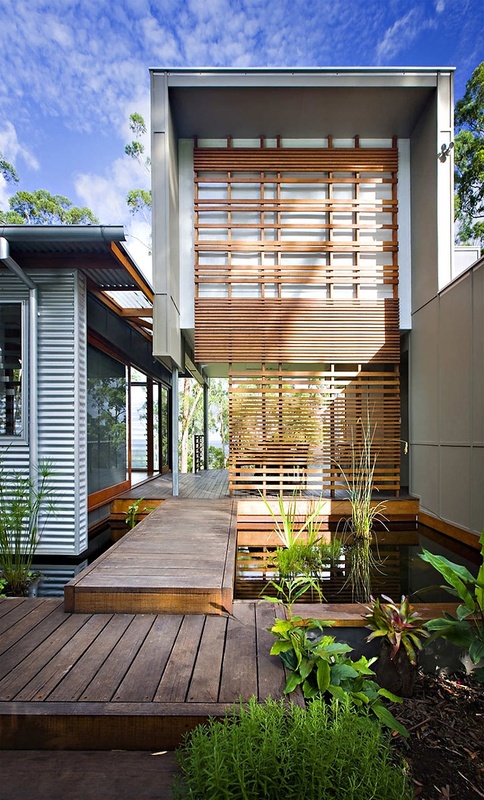 I absolutely love the jetty-style entrance with water, it will echo the view from the back very nicely.